The Lauderdale Bay condominiums along Hwy 17 Bypass near Market Common are some of the finest residential condos in Myrtle Beach. Construction is about to begin on a new community of single-family homes along the Intracoastal Waterway next to the condos - Lauderdale Bay Estates. 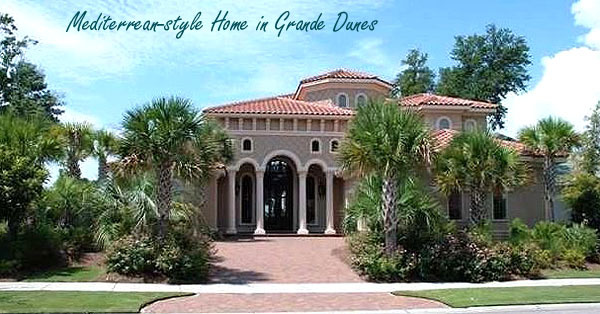 These large luxury homes will be designed with a Mediterranean architecture, similar to the homes in Grande Dunes. You'll find arched stucco/brick exteriors with gorgeous landscaped lots and luxury appointments. There are 12 models to choose from, from the 2514 sq ft, 3 bedroom Hollywood floorplan to the 3902 sq ft 4 bedroom, two-story Delray II. The builder can customize your home to fit your taste as well. They plan for 50 homesites, with 26 having direct waterfront access, and many others with a water view. 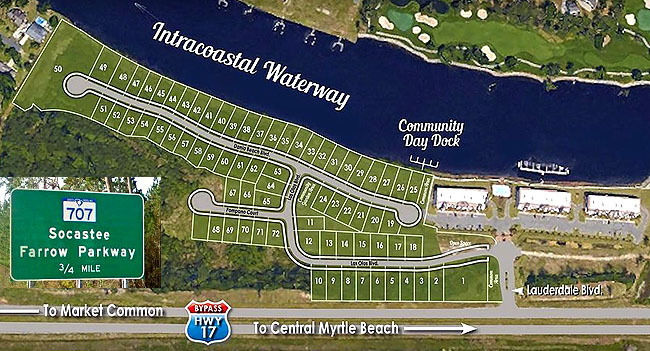 The community will have a private dock for fishing in the Waterway or just relaxing to watch the boats go by. If you want to build a brand new luxury Waterway home, Lauderdale Bay Estates promises to be one of the finest opportunities you'll find. Let us represent you as your buyer's agent and negotiate with the developers. Call us for more information. We'll update this page as well when more plans are revealed or new homes in Lauderdale Bay Estates are available. Listing courtesy of Native Homes Realty, LLC , Ashley Taylor.